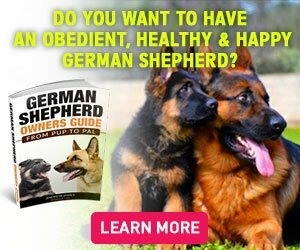 Many German Shepherd owners complain that their dog doesn’t follow their commands, ignores their actions and voice signals, and much more. This is a common problem with GSD owners as this breed of dogs is very dominant. We all know German Shepherds as guarding dogs we see with police forces. Of course, these dogs are extremely intelligent, and if trained well, they will learn anything. Your dog doesn’t respect you enough to listen to you. Your dog doesn’t see you as a leader or the boss. GSDs are extremely powerful and governing. If they are not trained properly in their initial days, they will have issues when you try to become a leader. These hierarchical issues become a huge problem for both the dog and the owner and ruin the dog-owner relationship completely. The main idea is to make your dog understand that you are the boss, not him/her. When your GSD starts to exhibit disobedient behavior, act immediately. Letting the dog misbehave is not going to turn things around. A happy GSD is one that feels safe under its owner’s lead. So, if your dog is getting out of hands and establishing itself as the authority, stop it right there. Due to their nature, they tend to become dominant, but it is the responsibility of the owner to bring it back on track. There are simple ways with the help of which GSD owners can re-establish themselves as the authority. Never let your dog leave the house before you. Don’t shower your love on your dog just as you arrive home. Always eat 30 minutes before your dog so that it knows that you are the alpha. Do not let your dog enter every area of the home and limit its area. Do not let your dog jump on sofas, bed, and furniture because this behavior can make your dog feel like the boss of the home. If your GSD wants to play and grabs a cushion in its mouth and comes to you, do not start playing immediately. It might be intimidating but giving attention to the dog on its will is going to make it feel like an alpha. Don’t let your dog leave the car before you. You don’t want it to feel that you are following it. 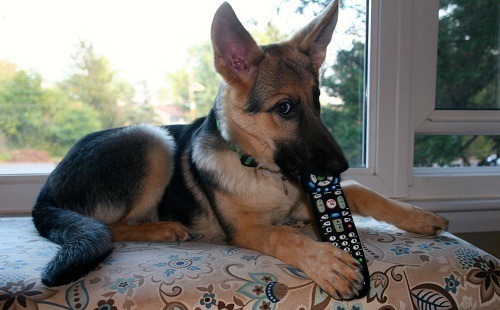 If nothing works and your German Shepherd is showing signs of bad behavior, follow an obedience training process. This type of training is especially very beneficial for GSDs. If you let your dog become the alpha, you’ll soon start to face a lot of problems. It will not only disobey you, but it will also ignore your commands. Make sure that the training sessions are no longer than a few minutes as it will become frustrating for your GSD. Once your dog feels bored, it will get distracted and not listen to your commands and instructions. Making the Disobedient Behavior Stop! So how do you make your GSD’s behavior better? How will you make it listen to you? Many times GSD owners who are facing disobedience problems with their dogs adopt a wrong approach that instead of putting them back on track worsens them further. The key in this type of situation is to act in a way that your dog would understand. A German Shepherd’s natural instinct is to see other people and animals as a pack. Hence, they rank every member of the pack according to their behavior and itself as the pack leader. When you let your dog dominate, it will start to ignore your commands because it has established itself as the leader of the pack. However, if you fail to establish your position as an alpha, your GSD will start to ignore your commands. To avoid this kind of behavior, a GSD owner should react immediately. Don’t make your dog feel that it has gotten control over you. Stop it right away or give it a little tap on its head to tell it that you are still the boss. For Example: If you take your GSD for a walk in the park, and it is playing with other dogs while you walk. You are at a distance and want your dog to come to you. You command it to ‘come’ or say its name. Your dog looks at you and doesn’t respond. This is a crucial thing that owners should understand with an open mind. When your dog is playing with other dogs, it is actually having fun. However, when you call its name and order it to come to you, it will have to decide between stopping the play and coming to you OR ignoring you completely. Of course, it is fun to play, and your dog is enjoying its time. So, why do you think it would listen to you? Go to your dog and pull its collar so that it understands that you are asking it to stop. Speak in a low but authoritative voice to tell the dog that you are serious, and this attitude cannot be tolerated. The best way to make your dog learn to behave is to train it with a lead on. If you let the dog be on its own, it will feel that it can do whatever it wants to. However, having a leash on until your dog is not fully trained, you are giving it a message that you are in control of its actions. It is Time to get Disciplined! 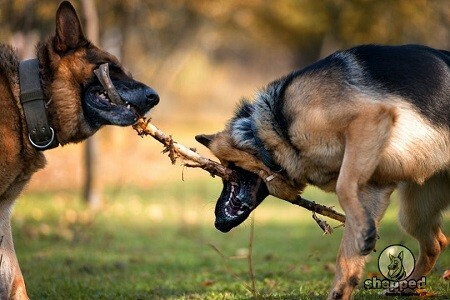 German Shepherds are highly confident dogs. This means that they will not like anyone else interfering in their business. If you are facing troubles training your dog to obey you, sign up with us and follow the tips on our site.